I would love an explanation of measurements for gymnastic lines and poles on the ground. I understand that a horse canter stride is ideally 12 feet. No one has been able to explain to me a gymnastic line distance of 9-18-21 feet for placement of jumps… other than, “that’s the way it is and it works.” Also why are canter poles set at 10 feet not 12 feet? If you have two poles on the ground at 24 feet apart, should your horse put in a one canter stride? Thank you. There is logical answer to this one, I’m surprised no one took the time to explain it to you. 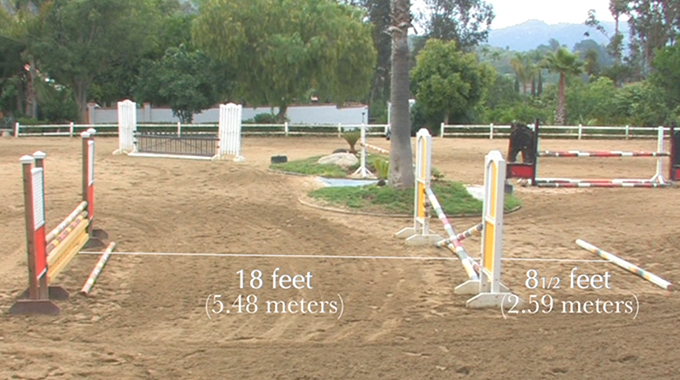 The “average stride length” of 12 feet that we use applies quite well when the “average” horse (not pony) is negotiating fences on a course set at about 2’ up to 3’ in height. As hunter courses go up in size, that ‘average’ lengthens (to around 12’6” for 3’6” courses and to 13’ or longer for 4’ fences and up). Hunter lines change because the jumping arc lengthens, as well as the stride, as the level of jumps (and horses) goes up. When we measure fence to fence, we generally add in one ‘stride’ length to account for the landing and takeoff distance; hence a 4 stride distance in a smaller hunter class might use 60’ as the inside distance between two jumps. 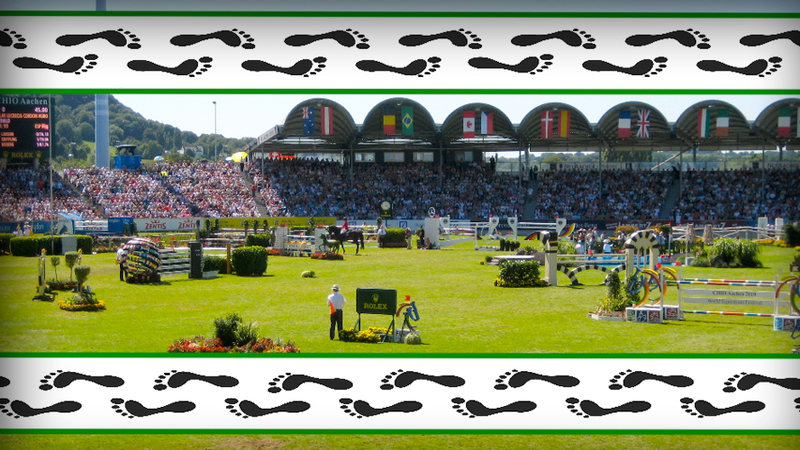 Interestingly enough, in Jumping competition distances, we ride similarly whether the jumps are lower up or very big. This is due to the changing arc over the jump with horses of more or less training and ability, along with the difference in both shape of the jumps and their width. Jumper courses remain close to 12’ increments for an average 3 through 8 strides – other factors enter in for combinations and some other circumstances which I won’t go into. 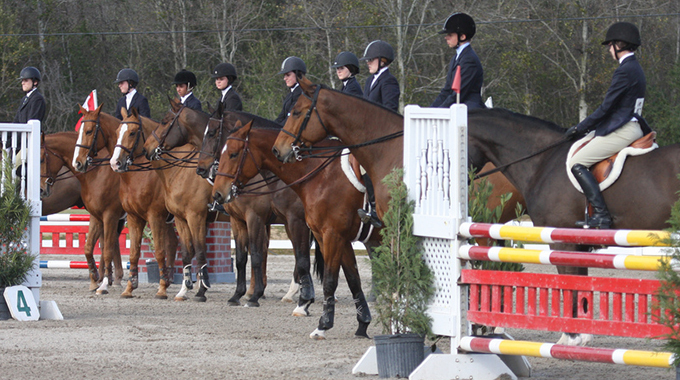 A major part of Jumping courses is the horse and rider’s ability to solve distance and striding questions posed by the Course Designer, so rules for Hunters don’t apply. Everything above applies to negotiating COURSES at an appropriate cantering PACE for either the Hunter or Jumping disciplines. Training at home is a different matter. Training for horse and rider is not very complete if you simply jump around course after course with no attention paid to how the course and the individual jumping efforts are dealt with. Thus most every trainer and coach uses a few, or many, of their favorite schooling exercises to improve a horse’s rideability, balance, or technique. These also serve to develop a rider’s feel for their horse’s balance, pace and stride, along with their own balance and a secure seat. To save unnecessary wear and tear on the horses, we often use poles on the ground, low cavaletti, or very small jumps for this work. It can be just as effective for learning, as mistakes are a part of learning new skills, and are far less punishing to the horse. 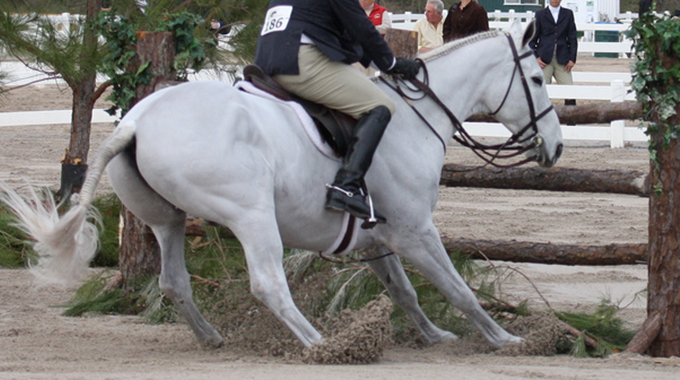 Working at the trot can be useful and requires significantly shorter distances than approaching at the canter: hence the basic schooling grid that enters at the trot over a cross-rail (often with a placing rail 8’ to 9’ in front of it), followed by a quiet canter stride in an 18’ distance to a second vertical, which is followed by another obstacle using one stride at the now lengthening canter set at 21’. I hesitate to give exact dimensions for different exercises since a pony and an OTTB will have very different natural stride lengths! A well schooled horse familiar with these exercises will have developed a far better ‘eye for the distance’ than even the best rider will ever have. This is an important reason for this work: in one or two stride combinations, it is too easy for a slight miscommunication between rider and horse to create a big problem. The horse should be capable of judging his stride and balance in these distances with the rider simply quietly supporting his horse without interfering. When you are doing this work on your own, it is important to be able to start with distances that are comfortable for your horse. In my book, 101 Jumping Exercises for Horse and Rider, I explain how to do so using rails on the ground at first. 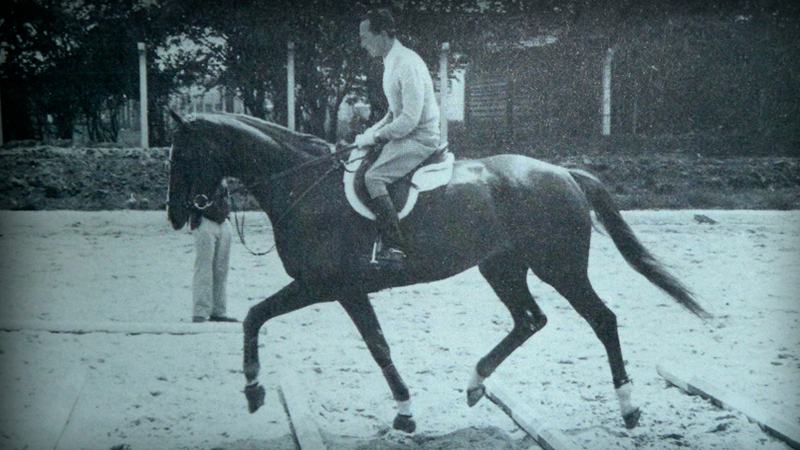 Appropriate take-off and landing depends greatly on the size of the obstacle; if it is a simple rail on the ground the stride of the horse will fit over the rail with no additional room needed. Smaller jumps and training work at home are generally not as effective when done at the full pace that you will use in competition, so distances will be shorter depending on what you want your horse or you to learn or practice. The main point of this work is to develop a consistent rhythm and balance in all your jumping work. Once this is truly established, it is a very easy matter to open or close your stride and/or energy level to be successful in any competitive environment you might meet. Good luck and have fun with all the exercises you do at home! Bernie is bringing back The Master, Bert de Némethy. In this topic Bernie introduces us to a modern system of incorporating cavalletti with fences that was developed and perfected by de Némethy. Bernie was privileged to learn this system personally from Bert. In “The Basics” (part one of a three part series), Bernie breaks down course walking into its most basic components. This topic addresses take off distances, perfecting an accurate walking stride length and the available track options. Julie Winkel puts on her judge's hat to help a member who wants to know the best moment to change to the counter lead or trot a jump in equitation work-offs. 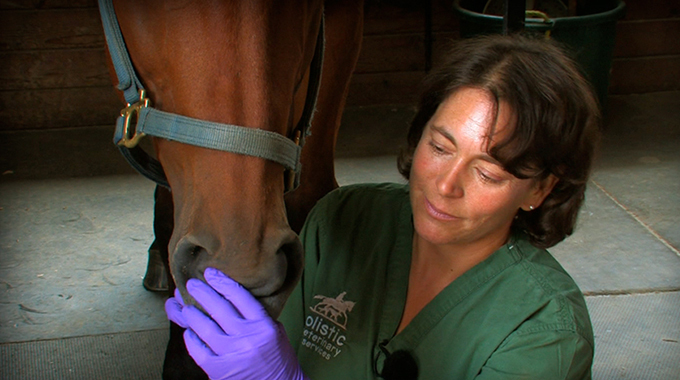 Member Becky Weik had a question on how to encourage her horse to stretch his back and accept the bit. Bernie lends his expert advice on this topic. Bernie shares techniques on what to do when your horse stops at a jump. He offers advice for a horse that does this out of bad habit and for a green horse unfamiliar with a new jump. When do You Teach a Rider to Put a Horse on the Bit? Starting Your Own Barn? Here’s Your Business Startup Checklist!